"Although most of the space in the World Trade Center complex was off-limits to the public, the South Tower featured an indoor and outdoor public observation area called Top of the World Trade Center Observatories on its 107th and 110th floors." I also recall that it was a windy day - and the whole thing was swaying most alarmingly ! Viewing this I am immediately struck by the clarity and detail in every aspect of this video, likely shot on a small 1/3" CCD consumer/prosumer DV cam or possibly an analog camera. There is stark contrast between this video and the 9/11 videos shot by the broadcast cameras with their full 2/3" CCDs that evidently all had massive malfunctions in terms of focus and resolution that day. Not to mention of course, the temporary ineptitude of the camera operators to frame and follow anything of actual interest and importance, aside from the limited perspectives required to drive the hopelessly fantastical narrative. That got me wondering. According to a cursory search, I am doing something else right now so I took the first result: "Technology sure has changed since then... but back in 2001, a Sony DCR-VX1000 camcorder was state of the art, as well as a Video Walkman for editing." This is basically what I had in mind! RE Simon's windy day. How great of an engineering feat would it have been to connect both towers with braces to curtail the swaying effect? 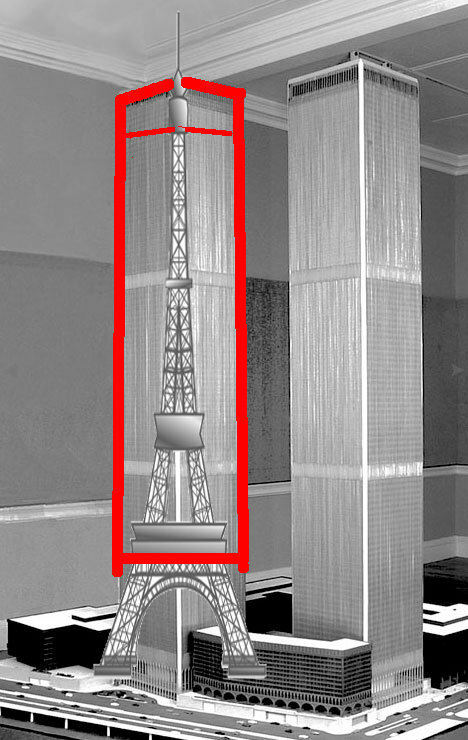 The Eiffel Tower sways, because it was built to. Actually, it is 75 deg. oops! ...trip to the optometrist coming up! apologies and thanks for correcting me agraposo. Wow. We've theorized that the WTC buildings were empty except for the restaurant at the top of one of them. Take a look at the cover of New York magazine for May 31, 1976. And here's the article inside that issue. fbenario wrote: Wow. We've theorized that the WTC buildings were empty except for the restaurant at the top of one of them. Take a look at the cover of New York magazine for May 31, 1976. That's exactly what I meant when I suggested that the buildings were Engineering Hoaxes. Bottom third possibly populated, possibly not, the top two thirds an empty shell with only the restaurant on top. ACME Dem. Co. could have done the job in a week! brianv wrote: That's exactly what I meant when I suggested that the buildings were Engineering Hoaxes. Bottom third possibly populated, possibly not, the top two thirds an empty shell with only the restaurant on top. ACME Dem. Co. could have done the job in a week! That reminds of something very interesting I read. This was on an architecture forum, no conspiracy exploration or anything, they were just discussing cities, and someone mentioned that most American cities seem to build structures and then wait on the tenants to arrive instead of the other way around - secure demand first, and then build. In fact, in Minneapolis where they continue to develop skyscraper condos, I was told by planners they are supposed to get 60% occupancy before even starting the construction, but that it's pretty rare. So skirting the rules in large construction seems to be par for the course. My guess is, because of our centralized technocratic 'governments', we've got a limited number of people who even review these sorts of things. I wouldn't doubt it if I heard it was a single employee carrying out decisions as poorly as they deemed fit for themselves. Depending on the project and the gangs overseeing it, money and persuasion moves a lot of these decisions through the bureaucracy fast. Much faster than the only paths available to those of us considered 'lower tier' folk. Why not? Amazing idea! I like it!